Synthetic monitoring gives you the option of creating two kinds of browser monitors—single-URL and clickpaths—to check the availability and performance of your web application at regular intervals. Single-URL browser monitors conduct availability tests of a single page of your website or web application. You also have the option of checking performance. Select Synthetic from the navigation menu. 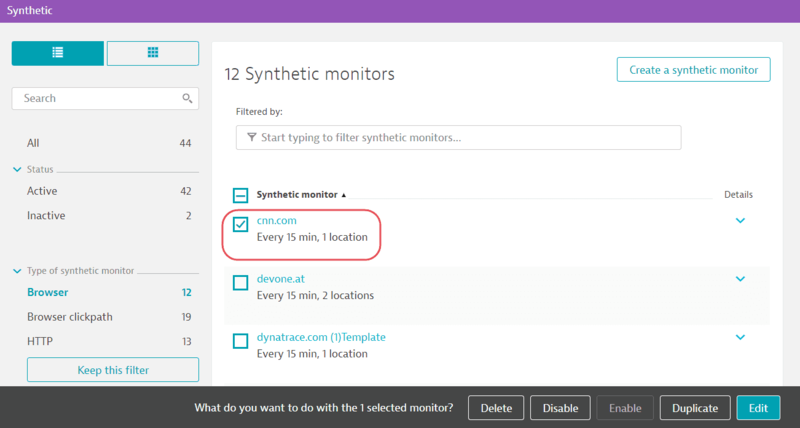 Click the Create a synthetic monitor button at top right. Click Create a browser monitor. On the Configure a synthetic monitor page, type in the URL you want to monitor and either use the default name or provide your own. 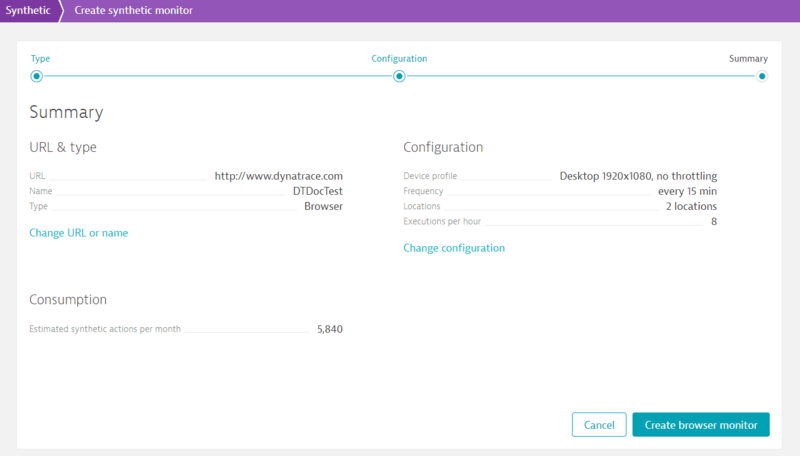 Configure your monitor appropriately, including selecting the profile of your emulated device, choosing monitor frequency and locations, and other settings. Click Monitor single URL at the bottom of the page. On the Summary page, you can review and change your configuration (Change URL or name; Change configuration). Click Create browser monitor. Within a few minutes, you&apos;ll receive monitoring data for your new browser monitor. Optionally, click Browser to filter for single-URL browser monitors. From the list of browser monitors, click the browser monitor you want to examine. You&apos;ll then be directed to the details page for the browser monitor. 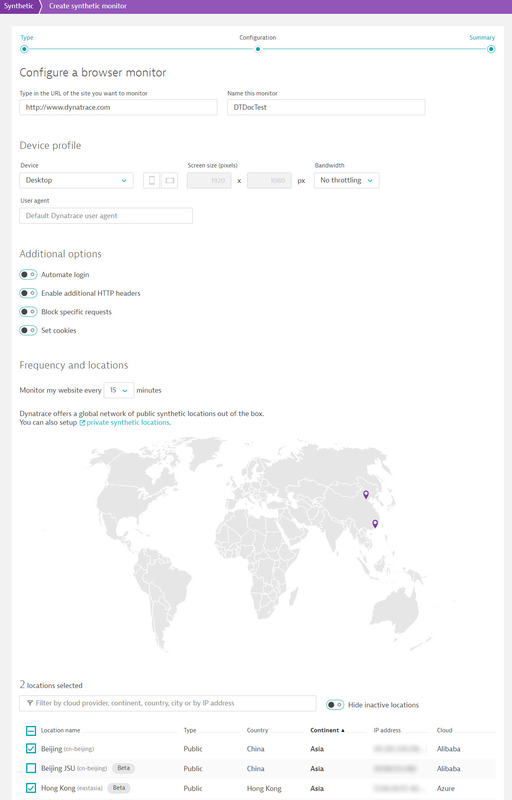 The details page of each monitor provides detailed results, for example, availability metrics and problems detected. Click the Browse button (...) and select View report. Select the month and week for your report time frame. While viewing the Availability report, you can choose to receive a weekly or a monthly availability report and even share the report by clicking the Browse (...) button and selecting the respective option. When you first set up your monitor, reports are available after the first weekly run (made at midnight on Sundays). Navigate to the Synthetic dashboard. Opt to view the dashboard in list format. Check the box next to the monitor you want to delete or disable. Click Delete or Disable at bottom right. Click the monitor you&apos;re interested in. Click the Browse (...) button and select either Disable or Delete.